The global solder balls market is benefitting tremendously with the expansion of the automotive and electronics sector. Rapid industrialization and economic development in several parts of the world have led to an improved standard of living. Consequently, this has led to an increased demand for high quality and environmental friendly electronics and automotive products. This is directly influencing the demand for solder balls for soldering processes in these sectors. Besides this, the advantage of contact reliability in soldering processes that use solder process is also leading to their increased use in the industrial sector. Moreover, products that are developed using high-performance solder balls display attributes of high reliability and high performance. On the downside, environmental concerns associated with the discharge of lead that is critical component of solder balls is proving to be a roadblock to the market’s growth. On the basis of solder type, the solder balls market has been segmented into eutectic and non-eutectic. Between the two, the non-eutectic segment the leading share of the market in 2016. The segments of the solder ball market depending upon alloy type are lead solder balls and lead free solder balls. Lead free solder balls held the leading share of the market in 2016, as the product is free of lead which is associated with environmental concerns. This has also been a reason for restrictions imposed on the use of lead solder balls in Europe and North America. However, lead and eutectic solder balls that contain lead as a raw material are cheaper and efficient as compared to non-eutectic solder balls. This has been a reason eutectic solder balls are still used in several parts of the world. In terms of size type, the global solder balls market is divided into up to 100um, 100um-400um, and 400um and above. In 2016, 400um and above led the market vis-à-vis revenue. Industrialization leading to urbanization in several parts of the world is a key factor for the prominent share of this segment. Solder balls of 400um and above are widely used in automotive and electronic sectors. The expanding automotive and electronics industries in China and India are displaying substantial demand for 400um and above sized solder balls. To serve the demand, leading players in the global solder balls market such as Senju Metal Industry Co. Ltd. And Solder Coat Co. Ltd. are primarily focused in the manufacture of 400um and above sized solder balls. Solder balls of size up to 100um are fewer applications. The global solder ball market is studied across North America, Asia Pacific, Europe, Latin America, and the Middle East and Africa in this report. Asia Pacific accounted for the leading share of the overall market in 2016 in terms of revenue. Going forward, the region is anticipated to display a significant CAGR amongst other key regional markets. This is mainly because of a rising middle-class population in the region that is spending liberally on big ticket items such as automobiles and electronics. Powered by China and India, the Asia Pacific solder balls market is expected to receive a boost in the forthcoming years. North America and Europe collectively held more than 45% of the overall solder balls market in 2016. Key players in the global solder balls market include Duksan Metal Co. Ltd., Hitachi Metals Nanotech Co. Ltd., Nippon Micrometal Corporation, Indium Corporation, and Senju Metal Industry Co. Ltd.
Solder balls are bumps of solder that has been placed manually or by automated equipment, and are held in place with a tacky flux to provide the contact between the chip package and the printed circuit board. Rise in quality and performance standards from end-user industries and improvement in living standard in developing countries across the globe is observed to boost the demand for solder balls across the globe. The report estimates and forecasts the solder balls market on the global, regional, and country levels. The study provides forecast between 2017 and 2025 based on volume (Units) and revenue (US$ Mn) with 2016 as the base year. The report comprises an exhaustive value chain analysis for each of the product segments. It provides a comprehensive view of the market. Value chain analysis also offers detailed information about value addition at each stage. The study includes drivers and restraints for the solder balls market along with their impact on demand during the forecast period. The study also provides key market indicators affecting the growth of the market. The report analyzes opportunities in the solder balls market on the global and regional level. Drivers, restraints, and opportunities mentioned in the report are justified through quantitative and qualitative data. These have been verified through primary and secondary resources. The report includes Porter’s Five Forces Model to determine the degree of competition in the solder balls market. The report comprises a qualitative write-up on market attractiveness analysis, wherein applications and countries have been analyzed based on attractiveness for each region. Growth rate, market size, raw material availability, profit margin, impact strength, technology, competition, and other factors (such as environmental and legal) have been evaluated in order to derive the general attractiveness of the market. The report comprises price trend analysis for solder balls between 2017 and 2025. 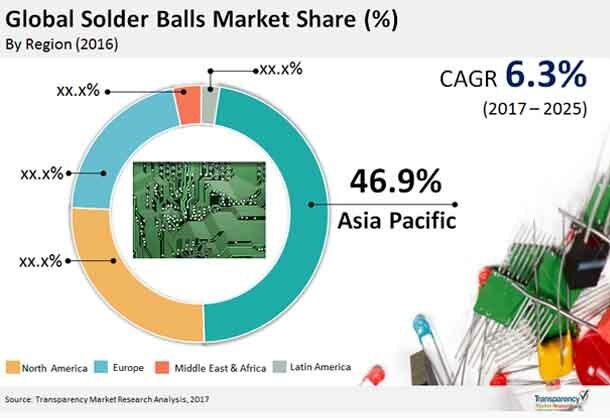 The study provides a comprehensive view of the solder balls market by dividing it on the basis of end-use and geography segments. The solder balls market has been segmented into up to 100um, 100um – 400um and 400um and above based on size type. Size type segment have been analyzed based on historic, present, and future trends. Regional segmentation includes the current and forecast demand for solder balls in North America, Europe, Asia Pacific, Latin America, and Middle East & Africa (MEA). Additionally, the report comprises country-level analysis in terms of volume and revenue for various segments. Key countries such as the U.S., Canada, Germany, France, the U.K., Spain, Italy, India, China, Japan, South Africa, Mexico, and Brazil have been included in the study. Market segmentation includes demand for individual applications in all the regions and countries. The report covers detailed competitive outlook that includes market share and profiles of key players operating in the global market. Key players profiled in the report includes Duksan Metal Co. Ltd., Senju Metal Industry Co. Ltd., Indium Corporation, Nippon Micrometal Corporation, Hitachi Metals Nanotech Co. Ltd. and others. Company profiles include attributes such as company overview, number of employees, brand overview, key competitors, business overview, business strategies, recent/key developments, acquisitions, and financial overview (wherever applicable).